I love baskets and I don’t care who knows it. I love bringing the culture into my home because I am a firm believe that when you surround yourself with your local culture you become attached and planted to your home! When you are attache and planted you feel comfortable, welcome and happy. When you’re happy you can spread that stuff everywhere! And that is what baskets have done for me, ha! I am most certainly a basket case. 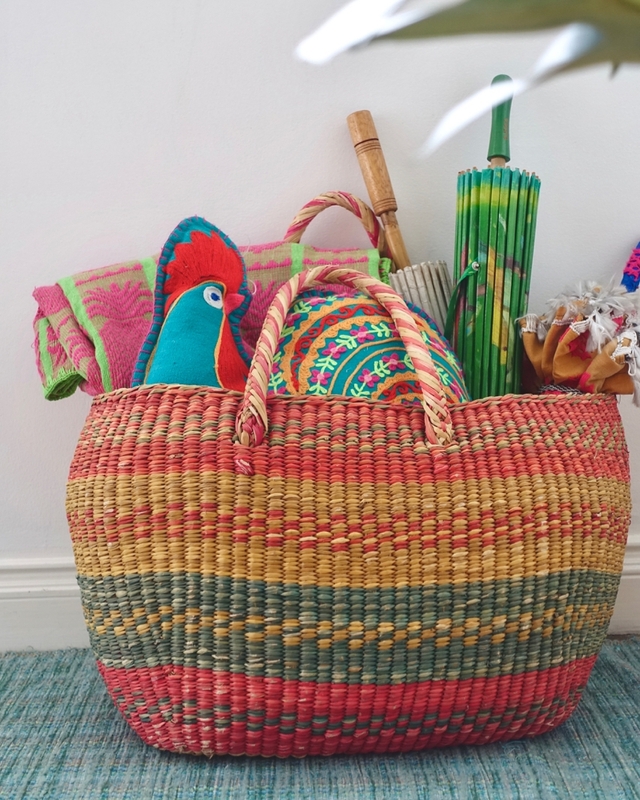 i spent the last few years coveting my moms woven basket from her time spent in chile as young adult. apparently, the apple doesn’t fall far from the tree. i was finally able to bring it home this summer to manila. I spilled the beans on my favorite markets and sukis before, today I give you an offering, a gift close to my heart that I am happy to share with you! Dapitan Arcade, located in Quezon City is a basket depot. You must be prepared to dig and get a bit dirty and sweaty. There is no one specific vendor, have a look around until you find a particular shop you like most. Tiendesitas has a number of stalls in their ‘Home’ section on the second floor near the elevator entrance and the back wall. My personal favorite is Magayon Handmade but there are a number of choices. Sacledo and Sidcor weekend markets have everything you want from food to fun but also … BASKETS! My favorite is a small vendor who sells these baskets from Abaca. The price isn’t the cheapest, it’s still affordable, but I have yet to find another vendor (besides Magayon Handmade) who has the selection they do. Never underestimate the power of a dry market and palengke, I have found some of my best baskets there and they are ALWAYS the cheapest. Also, I use the chicken basket, qubi, for everything! my preferred place to buy is at a dry market. my preferred dry market is marikina dry market but any palengke will do. Kultura is my go-to store for all things Filipino. This includes gifts, clothing, food and of course, baskets. Find a Kultura near you. How lucky are we that H&M Home has a number of locations located throughout the metro? The baskets at H&M Home are a bit higher in price but so is the quality and selection. This option is great for people who don’t want to have to search. C&C Home is a younger local brand that I have fallen in love with. They are completely online but if you want to view the pieces in person keep up to date with their bazaar attendance. We ventured to Paete last October and found the mother load of baskets. Paete is not near Manila, a 2-3 hours drive, but you can surely order some lovelies and have them delivered. Pwede!